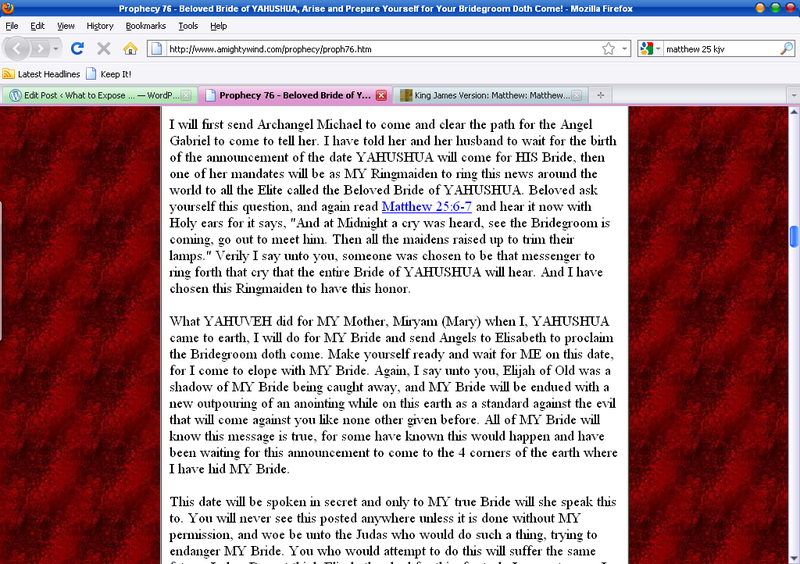 For those of you out there, who have ever visited the websites amightywind.com (or almightywind.com), you might have read what was written on the pages of the so called “Prophecy 76 – Beloved Bride of YAHUSHUA, Arise and Prepare Yourself for Your Bridegroom Doth Come!”. I will first send Archangel Michael to come and clear the path for the Angel Gabriel to come to tell her. I have told her and her husband to wait for the birth of the announcement of the date YAHUSHUA will come for HIS Bride, then one of her mandates will be as MY Ringmaiden to ring this news around the world to all the Elite called the Beloved Bride of YAHUSHUA. Beloved ask yourself this question, and again read Matthew 25:6-7 and hear it now with Holy ears for it says, “And at Midnight a cry was heard, see the Bridegroom is coming, go out to meet him. Then all the maidens raised up to trim their lamps.” Verily I say unto you, someone was chosen to be that messenger to ring forth that cry that the entire Bride of YAHUSHUA will hear. And I have chosen this Ringmaiden to have this honor. Okay … let’s read the whole Matthew 25:1-13, shall we?? Do you notice that all those TEN virgins, I repeat, ALL the virgins slumbered and slept until there was a shout that woke them up??? So, who is the so-called Ringmaiden of Prophecy 76, since the one who shouted in Matthew 25 isn’t part of the ten virgins at all??? 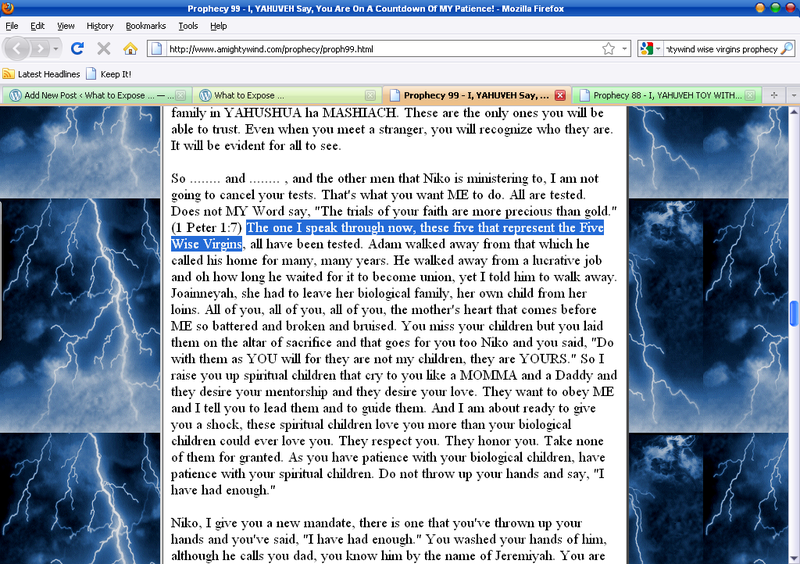 However, take a look at the other two “prophecies”, number 88 and 99. You see, every time you attack her, every time you attack her husband or one of the 5 wise, which symbolizes the 5 wise virgins, everytime you attack one of MY Bride (Revelation 14 and Revelation 7), there’s nowhere for you to hide. I laugh at you (Katah, katah, katah Holy tongue heard), only fit for judgment, only fit for damnation. Those of you who are the enemy of this Ringmaiden, of this ministry, of MY Bride, are only fit for MY damnation and it will be Hell, in a Lake of Fire you will reside! amazing, the ringmaiden is part of ten virgins of Matthew 25?? So …….. and …….. , and the other men that Niko is ministering to, I am not going to cancel your tests. That’s what you want ME to do. All are tested. Does not MY Word say, “The trials of your faith are more precious than gold.” (1 Peter 1:7) The one I speak through now, these five that represent the Five Wise Virgins, all have been tested. The one "I" speak through now, these five that represent the Five Wise Virgins??? Oops. I thought the “ringmaiden” (according to the claim in Prophecy 76 back then) was the one who would shout at that midnight hour of Matthew 25. Wait a minute, the “ringmaiden” wouldn’t be part of ten virgins, right? Matthew 25 says ALL virgins were sleeping until the shout in that midnight hour woke them up! How come the Prophecies 88 and 99 again claim that the ringmaiden is still part of the 5 wise virgins? ALL the ten virgins in Matthew 25 ARE sleeping! Matthew 25 verses themselves are exposing that there is something wrong with the so-called “ringmaiden” of “Prophecy” 76. Now, who will be shouting at that midnight hour then??? Whose voice will it be??? Oops … the one who will shout at that midnight hour, according to 1 Thessalonians 4:16 will be the archangel. And who is the archangel? Oops … the archangel’s name is Michael, not Elisabeth Elijah Nikomia. And the archangel is a ‘he’, not a ‘she’.